There are various outdoor activities to enjoy at Sauble Beach in Ontario, Canada which runs for 11 kilometers along the shores of Lake Huron. Sauble Beach in Ontario, Canada is an extremely popular destination especially during the summer months when locals and tourists come here to enjoy the numerous outdoor activities. Campgrounds are located along Lake Huron as well as cabins, cottages, hotels and bed and breakfasts, a variety of accommodations to suit any type of traveler. On the sandy shores of Lake Huron, Sauble Beach runs for 11 kilometers where some of the outdoor activities include jet skiing, swimming, tanning, fishing, kitesurfing, boating, windsurfing and waterskiing. 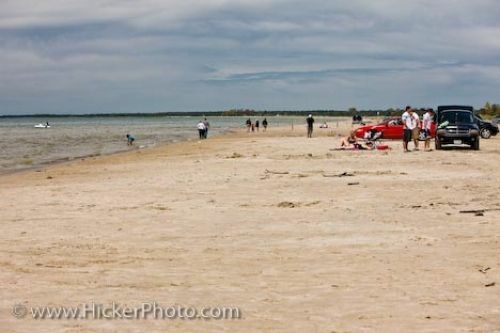 People can drive their vehicles right onto the sandy shores of Sauble Beach where they can easily reach their equipment needed for the outdoor activities. Rated as one of the top 10 beaches in the country, the warm crystal waters of Lake Huron lures in many newcomers each year. People traveling from Toronto, Ontario can reach Sauble Beach in Ontario Provincial Park in Canada within about 2.5 hours. Picture of people enjoying the outdoor activities at Sauble Beach in Ontario, Canada, where Lake Huron laps up onto the sand. Sauble Beach on the shores of Lake Huron, Ontario, Canada.